Santosh Dawara. May 23, 2012. Here’s some key concepts behind how BookEazy’s booking engine works to book tickets with Multiplex systems ShowBizz and Vista. I wrote it out as a business associate was interested in the details. Here is a closer look at how it worked. A few notes that will make it easier to understand the terminology used. A Show is a unique combination of Multiplex (Inox Pune), Screen (#2), Date – Time (May 21st, 4.30pm). A Multiplex is always a single unit with multiple screens each. For instance – INOX Pune, City Pride Deccan and City Pride Kothrud are each Multiplexes. In all cases “Multiplex system” refers to the centralized Multiplex online booking service or API. Retrieving Schedules from the Multiplex and Creating Shows. The first step is to synchronize with the Multiplex system and retrieve show information every week. Multiplexes will usually create and release their shows weekly a couple of days in advance. BookEazy makes it easy to help you pull in the shows as soon as they’re available with the Multiplex by offering your operators a manual method to check for new shows and by itself periodically polling the Multiplex servers for new shows. When new Shows are found, BookEazy pulls in Show information from the respective web-services – including Screen layouts, and then releases these Shows on it’s online booking interface. When creating Shows BookEazy supports any seat booking or quota restrictions that have been preconfigured for each Screen. Shows are then verified and released by your Operator for booking by your Users. After a user has selected the Show she prefers – BookEazy supports temporary seat blocking across classes. The experience is optimized for the best User experience possible and considering seats maybe booked simultaneously by multiple Users and vendors. Users are shown their seats and the Screens seating arrangement to learn how far away from the screen they really are. On confirming their seat positions, User’s can use BookEazy to block seats for a limited time-period with the Multiplex. 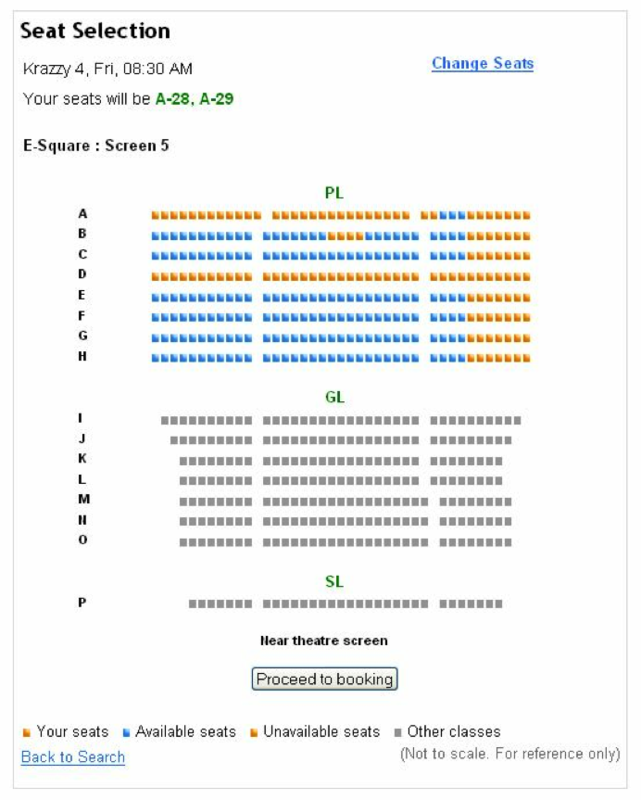 If the User does not complete her booking within the same session, the blocked seats are released by the Multiplex system after the time-period has expired. You can configure BookEazy to automatically ‘close’ shows for booking at a preset time before the Show begins. Once a Show is closed, Users may no longer book tickets and the Show is removed from Show Search listings. Multiplexes may require vendors to close shows ahead of Show start time for business or logistical reasons. BookEazy also allows your operators to close a Show if it has been canceled under exceptional circumstances. This feature pulls in payment and attendance information from the Multiplex system and can be used to track attendance percentages. Questions? Leave a comment below and I will get back in touch. Interested in Acquiring an Online Movie Tickets Technology? This will help. Quite an interesting article. Showbizz and vista have webservices exposed? Wondering if I can have a look into those webservices? I’ll definitely let you know if that is possible. Yes it will be great if you can share me details of these webservices. Thanks in advance! We are web design and development firm and interested to discuss the API model for on-line ticketing. Also does it works will all the cinemas. We don’t have an API model to offer at this time. As mentioned in the post, the technology we support includes the major multiplex backends out there. Happy to get in touch directly on email – santosh at tinkeron (dot) com. We are planning to start a new online movie ticket booking portal. Will your product bookeazy will cater our need of booking process. If not, can you suggest us a solution/product for the same? Thank you for getting in touch. I’ve replied to you on email. hi santosh, i m planning a movie ticket booking website. can u develop api for me. Hi Jagjit, let’s talk on email? Email me santosh [at] tinkeron [dot] com. Iam also in search of getting this technology with my website which Iam going to start .Please I want the complete details of starting a movie Ticketing portal . I needed your reply for my question that I asked through the email .Please I needed your support . Sorry about the delay. I will be in touch with you very soon and appreciate your patience. As per our phone conversation, I am awaiting your confirmation on email. Hope I have been able to help. Please email santosh at tinkeron (dot) com. Do easybook have webservices? If yes what are the languages supported. JAVA/PHP/.net? where can I find more details? We don’t have a live web service and we’re open to licensing the technology (written in PHP). I’m doing my thesis on WordPress, by developing a music mall with online ticket selling. I’m looking for months for a seat hall reservation plugin which I can add in my WordPress site, but 1-2 I found are not free. Could you please advise me if there’s any solution to my problem? You might have to have such a plugin developed by a WordPress developer. I don’t know if there’s one out there that will work for you.